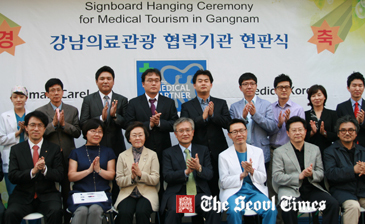 Gangnam Mayor Shin Yeon-Hee (3rd from left in front row) poses with other participants at signboard hanging ceremony. Gangnam Mayor Shin Yeon-Hee launched the signboard hanging ceremony for JK Plastic Surgery Center in Seoul's Shingsa-dong area on Oct. 4, 2012. On the day JK became the first clinic of the 28 medical institutions for cooperation in the medical tourism field to be presented with the signboard approved by the mayor as a model institute for the other medical centers. Designed by university professors, the signboard served as a form of recognition for tourists to recognize JK as one of the medical centers which deliver outstanding medical services to its patients. The ceremony was attended by scores of medical specialists including CEO & MD Joo Kwon of JK Plastic Surgery Center and President Lee Byung-Seok of Gangnamgu Medical Tourism Association. 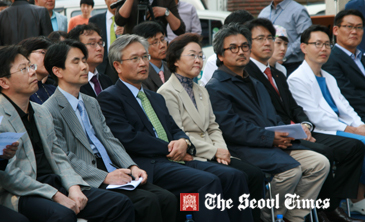 Gangnam Mayor Shin Yeon-Hee (4th from left in front row) poses with other participants at signboard hanging ceremony. JK established itself as one of the most frequently visited international plastic surgery clinics in Gangnam-gu, the mecca of the nation's medical tourism. In the opening speech Mayor Shin congratulated JK and hoped that JK will continue to improve its services and serve as a role model for the other medical centers in Gangnam-gu, as well as in the nation. The ceremony was subsequently followed by an exceptionally arranged tour around the center for the guests to gain a better understanding of the surgery processes and medical technologies used during the operations. Ten years since its opening, JK has attained a record of having the highest number of clinical cases in Korea without causing a single medical accident. Gangnam Mayor Shin Yeon-Hee (center) poses with CEO & MD Joo Kwon (left) of JK Plastic Surgery Center and President Lee Byung-Seok of Gangnamgu Medical Tourism Association. Placing their patient’s safety its highest priority, JK has acquired "ISO9001" from the Joint Commission International, which audits and accredits international standards to medical clinics which deliver quality, safe and efficient health care to patients. JK distinguishes itself from other plastic surgery clinics by providing accommodations, transport and also translation services to its overseas patients. JK sees most of its international patients from China and Japan. Last year alone a total of 24,535 foreign medical tourists visited clinics, hospitals, and other medical insitututes located in Gangnam City, making Gangnam as the city visited by largest number of foreigners for treatments. There are over 2,000 clinics, hospitals, and other medical insitututes concentrated within the posh Gangnam City. for details or inquiries please contact the Gangnam-Gu Office at 3451-2587 for Director Kang Hyun-Seop of Gangnam-Gu Office's Public Health Center.